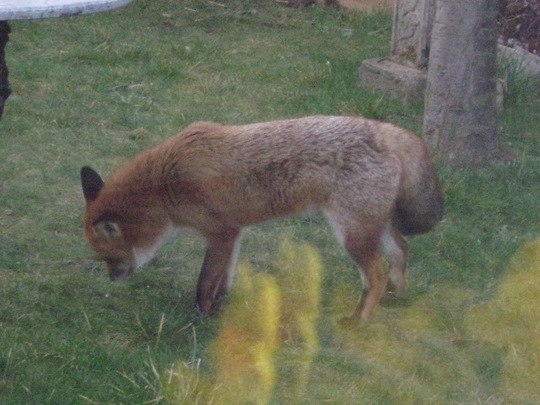 I never expected to see a fox near the seaside ! Every time I saw him go towards my new rose bed, I tapped on the window and he just looked at me as if to say " ok" and moved back on to the lawn ! Next post: Update of the new garden. What a lovely thick coat! Didn't realise your new home is near the sea Rose - how near is near? There are either foxes or badgers actually up on the sea cliffs near here (tunnels under the blackthorn)so it doesn't seem thy mind the sea. I know we have a fox visiting us - there is a little track worn to the pond and I hear a vixen around November, but I think they only come in the dead of night. If I put a bone on the lawn its always gone by morning. What a lovely visitor I can see he/she still has got its winter coat. I think they go any where now having so many house and businesses greedy developers stealing their habitat. that is a beautiful visitor. They can be found in most habitats so the coast isn't strange. As a girl I have seen them 'fishing' in rock pools. Hope you see the fox again Rose. What a lovely surprise. Thanks Stera, its just a few minutes drive from us, round a corner and up a hill. Friends have told me of a walk which I could do with Rick in his wheel chair which is straight down our long street and through a cemetery which comes out not far from the sea front. I shall try that in the summer. No, its not a pleasant noise Shirley ! I agree Thrupenny, its the same everywhere now. What doesn't make sense to me is when they had all the multi-story flats pulled down, to make room for a football ground, then had to build more houses for these people! They are beautiful creatures Seaburngirl, one used to come regularly to drink out of our pond at the last house. Yes it was Chris. We were sat in the conservatory and it cheered Rick up seeing it. Will send you a pm today. It's simular here Rose they have allowed the university to take over our city to become a campus and building flats galore for the students yet they can not house our own people nor thousands of homeless and recent news say sharp rise in deaths of homeless here. They are even trying to build thousands of more houses taking up all of our green belt. In the last week or so our University hospital which takes on a few more local town s have protested along with the Wild life Trust of thousands of more houses being built . The hospital says it won't be able cope as they struggle now the other year it had to close its doors as it was full they asked for compensating for far more extra staff they will need to cope. Even a local town Nuneaton & Bedworth who also is nt coping took on some of our city house builds they too now have protested of any more being built the city traffic comes to a stand still if there is an accident on the M6 the pollution is horrific. They have built that much in the city century high rises I can no longer recognise my own city I was born and bed in I no longer go into the city centre nor do a lot of others..
Local people have done their home work and found we don't need any where close to the number of houses for Coventry people to be housed so who else are they planing to bring in. I know their plan is to eradicate villages all over by building on them. Oh how wonderful! He looks a very healthy fox. I would be thrilled if he visited my garden! Don't get me started Thrupenny ! My husband has been in and out of hospital since last June and at last he has been in to have his op. The hospital car park is now run by a private company and have to pay. Its not big enough for all the visitors and its a battle to get a parking space. The other day I parked and paid in the car park to find there weren't any spaces so parked alongside a grass verge and not in any ones way and got a £35 fine ! There was a lot of spare land in the hospital grounds which would have been perfect for another car park, but no...there are more houses instead ! Yes, he was Waddy and it was lovely to see him, even if he did pee on my plants ! Hahaa! That is awful Rose I would of complained and challenged the fine to the hospital or council it self its the same here privately run and charge an awful lot even the same for the nurses which I find disgusting they have now made the car park larger though . The only way is every one petition or complain to their mps about not enough spaces. You would think the hospital would of had the money for parking and fines then put it back into the nhs. I wish your hubby a quick recovery and best of health. As if you have nt enough worry I would go to the papers when you already had paid. Thank you Thrupenny. I am going to complain ! That's what it needs lots of people to complain here they went to the press as well with as lots of complaints hence the car park was made bigger when they rebuilt the hospital and again later. I often wonder what kind of people run our towns and cities hearing what I do as they don't seem to have any common sence what so ever. Here you would get fined double that. Charging nurses for parking is just disgusting. That's a Labour Council for you Steragram it s not the Labour my grand father helped to form with Keir Hardy years ago. It's just come to light they have just over spent £460.000 costing the tax payer here on a concert which should of been done by professional promoters but did it their selves having to return the money to clients as not enough tickets was sold then put those acts Rownan Keating and Gabriel in the free Godiva festival which hardly any Coventry person goes to this money could of gone on the nurses parking or the poor that have children going with out. Then what started out for a thousand houses on our green belt which they declassified a few years back has risen to four thousand and may be more that is just one part there are other parts to be built on to here no mention of another hospital or doctors to cope with all this. I ve been told their housing advises all other housing organisations around the country what to do so God help the rest of this country. You can't understand it can you? They are planning to close out A&E and build a new hospital miles away. We have crowds of holidaymakers in summer, lots of farmers (with farm machinery of course)as well as a huge catchment area of all the surrounding countryside and people from the country areas already have a long journey to the present hospital.. They have already moved the maternity services, of all things, so that birthing emergencies have to be taken miles away. If the decision makers had ever been loaded onto trolleys in labour they would have more compassion. And sooner of later there will be neonatal deaths. It blows your mind doesn't it. How to transfer my pictures ! Is this site secure !